The third child of a medium-scale entrepreneur in Jakarta, Indonesia, times were hard when Benny lost his father, his family's sole breadwinner, when he was about six. This misfortune pushed his mother to move the family to India where Benny obtained a few years of his education. Excelling academically did not halt any of the financial difficulties he faced to finish his schooling. Given the limited means to support this, Benny left India for Hong Kong when he was 18 in 1969 where he landed a job as a sales person in an apparel company. After two years in the same organization and one year in USA where he was assigned to work, Benny earned sufficient exposure to the industry that inspired him to commence his own business back in Southern China. His bread and butter, Bee Dee Manufacturing Co., began in a 650-square foot office space in Hong Kong with him as the founder, CEO, accountant, secretary, messenger and cleaner together with a maximum of three employees who multi-tasked on the remaining jobs that he could no longer handle. Exposed to early-life independence and heavy responsibilities, Benny became his own Boss at the young age of 21. Focusing on keeping ahead of other traders, he ventured into financing, importing, exporting, wholesaling, retailing and outsourcing apparels, toys, electronics, accessories, furniture and much more. After years of extensive buying trips to China, he chose to branch out in Guangzhou in the early 2000's because of the city's excellent direct train line to and from Hong Kong. "It's not only in Guangzhou that we source goods from," he reveals, Yiwu's unit prices are highly competitive but Guangzhou is far more accessible and technologically equipped; it also offered our clients a strong supplier base that gave birth to two of my other offices at the heart of Yuexiu District." A self-made multi-millionaire and a polyglot who speaks Cantonese, English, Hindi, Sindhi, Bhasa and Arabic fluently, Benny was no stranger in making do with the limited resources he had to make do with in Guangzhou when he was still starting out with his business. 20 years earlier, he recalls traveling with his clients through evening ships on an overnight journey that left Hong Kong at around 9pm to arrive in Guangzhou about 6am the next day. In spite of the comfort of the speedy metro systems which has now dominated the city, he manages to find advantages from that undersized method of transportation. "When your limbs stick out of the blanket, you learn to bend and curl them. The ships were equipped with several facilities that housed many passengers and rooms which we used for meetings. By the time we landed in Guangzhou, we had covered a lot from our program checklist already," He adds, "Back then, it was an effective means of transportation available and we meant business so we adapted with whatever resources there was on hand." The 62-year-old entrepreneur also confesses that he is confident in investing real estate in Guangzhou as it holds a sea port that can further boost the regions' capacity to streamline the export business in China. To date, Benny owns two offices at The World Trade Center Complex in Huanshi Dong Lu and a residence in Tianhe District. A very well-traveled entrepreneur across the globe, Benny confirms that he has never been to a single country without "Made in China" labeled products. True enough, with the rise of competing countries in the trading force like Bangladesh, Vietnam, India and Sri Lanka, to name a few, he believes that China is still far ahead by a long shot given its citizens and their experiences that contribute much to its leading the race. In plain words he informs, "As good as these other developing countries around are, China holds an immense number of populace that balances the possibility of decline and loss of investors. With its enormous line of local consumers, there will still be strength left to make use of its resources even if China loses a few of its sales to its competitors. Guangzhou, which I consider a leading business city and an attraction to the international market, is certainly worthy of additional investments." He also confides that his proceeds were drastically boosted since opening operations of his two offices in the city. This is ironic given the global recession and the notable price hikes of products in the market but he chuckles and explains "my clients had many times trimmed down their budgets on discovering the unit cost increases in the market; but as soon as they returned to their respective countries and realized that their rivals had also booked goods despite inflation, they immediately came back to me to multiply their order quantities." Because of its geographical location, Guangzhou is referred to as China's Southern Gateway and is home to more than 14 million people at the present. With over 40 consulate offices located within the city, Benny foresees that there will be more investors taking interest in Guangzhou in the future. 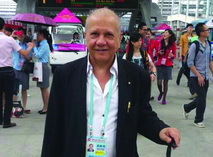 The biannual Canton Fair alone, which he's been an attendee at for over four decades now, is widely recognized across the globe, generating an export volume that amounts to billions of dollars. "No other city in China can host an event to top the Canton Fair in breeding this much revenue and international recognition; from pins to planes, you name it. The Canton Fair has it," he says. "With the rocketing tall skyscrapers, convenient metro system, developed scenic spots and well-organized wholesale markets of various commodities, I will have no apprehensions about extending more offices within the city; too bad that Guangzhou has now limited expatriates from acquiring real estate properties. I'll surely buy more the second this policy gets lifted," the entrepreneur adds.